India’s Amazing Tree Bridges Are Made of Living Roots and Vines! Villagers in Meghalaya, India have come up with a unique construction technique that harnesses nature in its purest form - they grow their own living bridges! 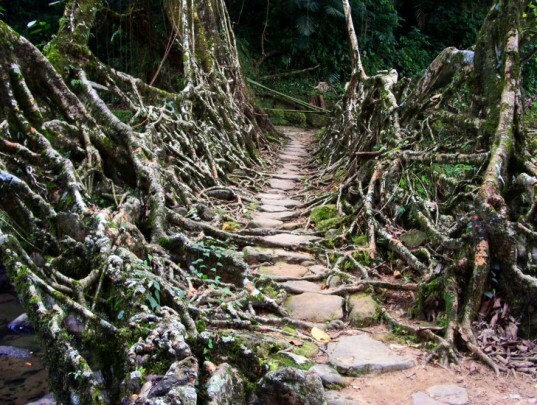 Using the roots of the Ficus elastica tree (rubber fig tree), the residents have woven an elaborate system of living bridges, some of which are thought to be over 500 years old. These extraordinary examples of living architecture are also lessons in patience, since they take about 15 years to grow. With age though, the living root bridges grow stronger and can often support the weight of 50 or more people at a time! The town of Cherrapunji in the Khasi Hills is credited with the world record for annual rainfall of over 75 ft! And in this rainy, wet climate, the rubber fig tree grows with abandon. The tree has a secondary root system that grows up above the ground floor and lets the tree easily grow on top of boulders and even out in the middle of streams. Long ago, the war-Khasis, a tribe in Meghalaya region, realized they could tap into the power of these roots and use them to their own advantage. By manipulating and directing the secondary roots, they could create ultra strong living bridges with which to cross streams and rivers. To make a tree grow in a certain direction, the tribespeople use the trunks of a betul nut tree, sliced down the middle and hollowed out, as a guidance system. The thin, tender roots of the rubber tree are placed so they grow in the direction of the tree trunk rather than fanning out. Eventually, the roots reach the other side of the river and grow into the soil. This process can take well over a decade before the bridge is fully functional and then over time the bridge grows and strengthens. Rocks are placed along the bridge’s sides to improve the footpaths. Some of these bridges are over 100 feet long and can even support the weight of fifty or more people at a time. These bridges are used daily by the people of the villages around Cherrapunji and a few are thought to be more than 500 years old. There is even a double decker bridge, known as the “Umshiang Double-Decker Root Bridge,” which features two bridges grown right on top of each other. It is thought to be the only bridge of its kind. 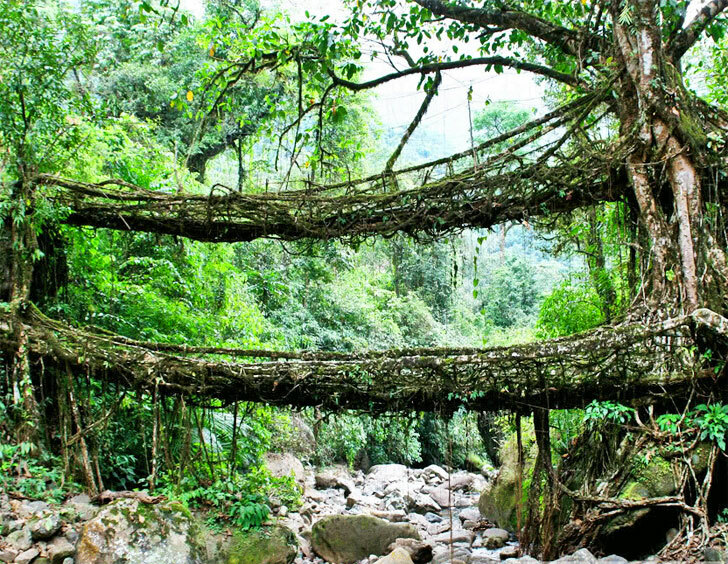 India's Amazing Tree Bridges Are Made of Living Roots and Vines! The town of Cherrapunji in the Khasi Hills is credited with the world record for annual rainfall of over 75 ft! And in this rainy, wet climate, the rubber fig tree grows with abandon. The tree has a secondary root system that grows up above the ground floor and lets the tree easily grown on top of boulders and even out in the middle of streams. Long ago, the war-Khasis, a tribe in Meghalaya region, realized they could tap into the power of these roots and use them to their own advantage. To make a tree grow in a certain direction, the tribes people use the trunks of a betul nut tree, sliced down the middle and hollowed out as a guidance system. By manipulating and directing the secondary roots, they could create ultra strong and living bridges with which to cross their streams.